Celebrating its 7th year of presenting some of the most up and coming young artists, The Young Choreographer’s Festival is producing the work of 13 18-25year old choreographers, selected by a highly esteemed panel alongside 7 Guest Artists at Symphony Space in NYC! This year’s performance will include the genres of contemporary, contemporary Indian, modern, jazz, heels, and street jazz. “Want to be inspired? Find your way to Symphony Space in NYC on June 2nd.” -Dance Spirit Magazine for the 2012 YCF. For the fifth year in a row, YCF is offering a talkback panel open to all young choreographers selected from 2010 forward. They will have the opportunity to hear from and question knowledgeable members of the dance community in an intimate setting. YCF Advisory Board Member, Wes Veldink, will host the 2016 panel. YCF is also providing its 2016 Young Choreographers with a Mentor. The mission of The Young Choreographer’s Festival is to present the work of up and coming young artists (ages 18-25) and give them an opportunity and resources to further their careers. YCF aims to educate, foster, and most importantly support the cultivation of young artists in all genres of dance, and encourage the development of all choreographic voices! 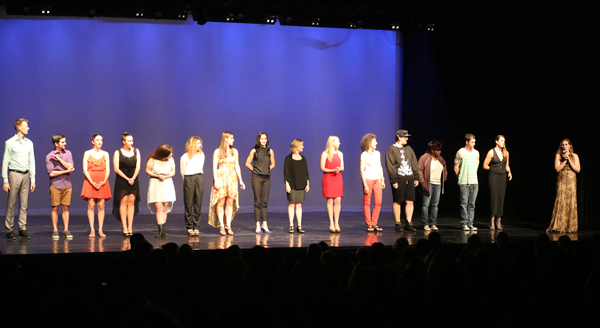 The Young Choreographer’s Festival was the brainchild of then, 20-year-old choreographer Emily Bufferd. With the aid of a distinguished Advisory Board, the 1st Young Choreographer’s Festival was presented at Symphony Space on June 6th, 2010. The Advisory Board includes: Desmond Richardson (International Dance Superstar, Complexions Contemporary Ballet), Tabitha and Napoleon D’Umo (Fox’s So You Think You Can Dance, American Idol, Cirque Du Soleil’s Viva ELVIS, Jennifer Lopez, Madonna), Michele Assaf (internationally renowned director- Mariah Carey, Mick Jagger, Michael Bolton), Tracie Stanfield (Master Faculty at Broadway Dance Center, Peridance Capezio Center, Artistic Director at Synthesis Dance Project), Laura Diffenderfer (Associate Programmer at The Joyce Theater), Rachel Bress (Associate Choreographer, ‘The Pirate Queen’ and ‘9 to 5’ on Broadway), Maurice Brandon Curry (Artistic Director at Eglevsky Ballet, former head of The Joffrey School and Dance Chair at USDAN), Pascal Rekoert (Lincoln Center Scholar, Past Associate Artistic Director at Jennifer Muller/The Works), Sheila Barker (Master Jazz Faculty at Broadway Dance Center, The Ailey School, and Marymount Manhattan College), Andy Funk (Founder, Monsters of Hip Hop), Shelly Hutchinson (So You Think You Can Dance Ukraine, Founder of Uncovered Choreography Workshops), Diane King (Executive Director, Broadway Dance Center), Bill Prudich (Founder/Executive Director, EDGE Performing Arts Center), Pam Chancey (PTC Productions, The PULSE on Tour), Ginger Cox (Professor of Dance and Anatomy at Pace University), Ryan Saab (Owner, StageDoorAccess.com), Wes Veldink (Choreographer for television/movies, Ani Difranco) Kat Wildish (Master Ballet Teacher, Dancer: American Ballet Theatre and NYCB). The Young Choreographer’s Festival is proudly sponsored by Broadway Dance Center, Peridance Capezio Center, The EDGE PAC, Bloch, Dance Informa, : pushing progress; a company/a workshop, Tezoro Productions/Live at Broadway Dance Center, and World Dance Movement – The International Workshop. Tickets are $28 for Advance Purchase ($30 day of), $25 Student/Senior. Groups of 10 or more contact [email protected]youngchoreographersfestival.com for special rates.